Don’t rely on “willpower”; decide you just don’t want it! Asking yourself “why” and reminding yourself of the outcome, isn’t always enough motivation to quit a bad habit. For example, your reasons for quitting sugar may include that you don’t like how you feel or look. In the case of smoking, it’s expensive, unhealthy and smells awful… Yet these reasons still don’t do the trick and you continue with your old habits. Take back your power by recognizing that you’re in charge. If you want to make a change, you can make a change. While it may feel like you physiologically need that piece of chocolate or cigarette, the fact is that you don’t. Remember you don’t want it! When you realize this, you are not fighting against yourself. This way you are not relying on willpower, which is ‘I want it but can’t have it because…”. Willpower waxes and wanes with your moods. When you change your perception and realize that you don’t really “want” or “need” to eat this way or to smoke, you are not fighting against a stronger will to continue. 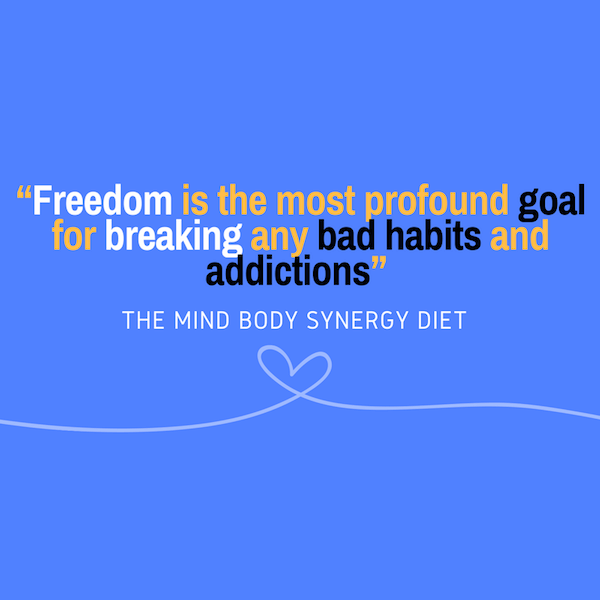 Your goal for quitting should be that you want to achieve true freedom from the habit, and it must come from within yourself.